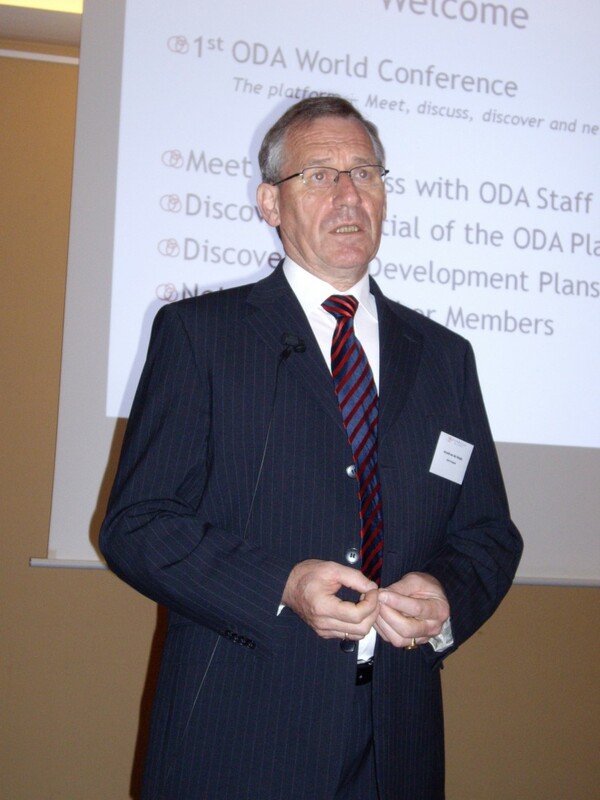 Arnold van der Weide, the President of the ODA, gave the opening remarks on the first day of the ODA World Conference, which saw a total of 92 attendees. He started by calling the members of the ODA staff, all 25 of them, and introduced them one by one. I finally got to put a face to the names of the programmers that I have been corresponding for all these years. These are the guys that work tirelessly in the background and make all the wonderful things happen. Arnold also felicitated Ralph Grabowski on his 600th issue of upFront.eZine by giving him a plaque. He went on the give a presentation on the ODA, its beginnings, what happenned in the past and what lies for it in the future. The ODA now has a new goal: “To develop a platform for Technical Graphic Applications”. I am glad the word “DWG” didn’t feature anywhere. He laid out what the ODA does and does not do. 1) Interface to the DWG and DGN file formats. 3) Create API’s for useful third party components like ACIS 3D Modeling, Redway’s Red engine, etc. so that ODA members can simply license and implement the components. Arnold spent some time on what he referred to as the “painful history” involving the embezzlement of $600,000. After the fiasco, an investigating committee was constituted to get to the bottom of the matter. In Nov 2006 the committee submitted its report to the ODA board and a decision was taken to fire the President at that time, Evan Yares, although he was not directly responsible for the fiasco. Evan was fired because it happened on his watch. The findings of the investigating committee indicated a lack of financial control. The ODA has now put in place a system to ensure that such an embezzlement does not occur again, which includes a new procedure for paying invoices, monthly financial statements and a yearly audit, among other things. At one point in time the ODA had 5000 Associate members. 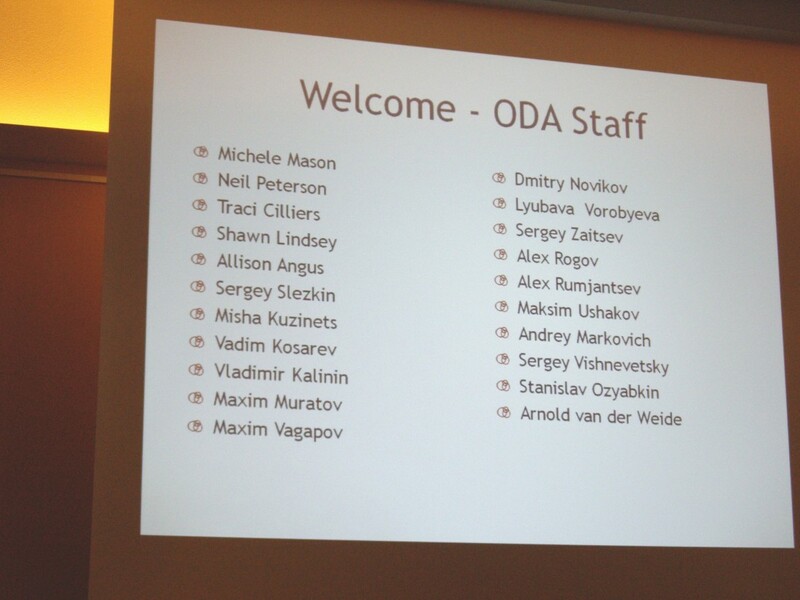 The ODA had one person full time handling these people, managing their agreements and keeping track of the software that they were building. Last year alone they closed down 4 web sites for wrongful use of the libraries. To put a lid on the situation the board decided to put a handling fee for Associate members and also created a special Educational Membership class. Arnold explained how the ODA technical team had two development streams, one for DWGdirect and the other for DGNDirect. This has now been streamlined to use the DWGdirect platform. Source code was spread across all over the world and there was no test system. It has now been moved to a single location on 13 servers. A bi-weekly status report goes out to every member to let them know what has been done, what is being done and what will be done in the future. Personally, I find this report very helpful. According to Arnold, the ODA is a stable organization and income is growing. In 2007, the ODA raised its membership fees, the first time in 10 years. That led to an increase in 23.7 % jump in income. Moreover the erosion of existing members has stopped. Contrary to expectations, there was a 11% increase revenue for in Q1 2009, in spite of the economic downturn. Arnold admitted that the legal battle with Autodesk on the TrustedDWG issue was a big mistake and was glad it had been settled. He thinks that it is unwise to give Autodesk an opportunity because they would use it. “Autodesk has been very successful in increasing our legal expenses. We have to be careful in what we do“, he reminded the ODA members in the audience. Arnold explained why every member will need to re-sign their membership agreements. The old membership agreements were written in 1998 at a time when web applications were not an issue. Now members are making use of their outdated agreements and developing web applications using the ODA libraries, thereby selling more licenses that they are entitled to. There will also be new membership class called “Corporate Membership”. As for the future, Arnold mentioned that the ODA was looking to support PDF as another file format. Support for more third party components is also on the cards as is more testing systems and procedures. The next ODA World conference will be in Florida. In the question and answer session that followed I asked Arnold whether ODA had a long term plan, say 5 or 10 years from now. He didn’t directly answer my question but did mention that he expected the ODA to continue to grow at 10% every year. He also saw a future where Autodesk would believe that the ODA is not a threat and is an organization that it can work together with.